When a hungry Stefan walks into a bar, you know there’s no good punch line. He snacks on the bartender before heading out into the rising sun to sizzle without his daylight ring. Elena jolts awake from this bad, and very real, vision, which Katherine also experienced. Katherine calls shotgun on Damon and Elena’s road trip to find the bar. Silas orders Nadia to prove her allegiance by finding out if Matt Donovan is really dead, and if not, to take care of it. Nadia finds Matt, but calls upon her friend Gregor who’s been hanging out as a passenger in Matt’s head. Her love for Gregor prevents her from killing Matt, but things aren’t looking good for Matt’s dominance over his body. Later, Matt’s finds that his memory has a gap and there’s a mysterious dagger in his pocket. Stefan awakens to find a woman throwing a blood bag at him. She pulled him from the quarry and knows things … and boy is that an understatement. Flashback to ancient Greece when Silas and this woman were the two most powerful travelers. Oh yeah, she’s Qetsiyah, but likes to be called Tessa now. Silas left Qetsiyah at the altar to run away with her handmaiden Amara, who happened to be the first Petrova doppelganger. When Qetsiyah found them in the forest having already consumed the immortality elixirs, she forced the cure upon Amara and ripped out Amara’s heart, literally. Damon and Elena enter the bar while Katherine naps in the car. Nadia interrupts them questioning the bartender, who does manage to give them details of Stefan being taken. Elena races to protect Katherine, who’s on the run, but Nadia abducts Katherine. At a cabin, Damon finds Stefan wearing Tessa’s compost pile, i.e. tied with vines to a chair surrounded by herbs and leaves. 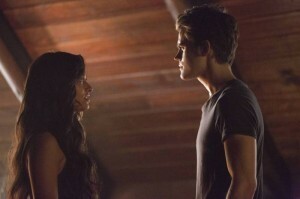 Tessa links Stefan to Silas, which greatly weakens Silas’ powers. Now she needs Katherine in order to force the cure upon Silas. As Stefan lies passed out, Tessa reveals to Damon that the doppelgangers are fated to fall in love with one another over and over again. Back at the Salvatore mansion, Damon tells Elena what Tessa said about their chance of a happy ending, but neither care about fate or destiny. When Stefan finally wakes, he has no memory of who Damon and Elena are. Season five of The Vampire Diaries has been on a roll, and “Original Sin” was no exception to this pattern. Although several of the series regulars were MIA for the hour, the episode contained enough of a blend between the greater Silas story and regular character drama that their absence was hardly noticeable. In addition, while the flashbacks weren’t necessary to Qetsiyah’s story, they spiced it up and made it feel unlike an introductory episode, despite this being the first time she appeared on screen. The title of this episode, “Original Sin,” perfectly encapsulates the theme. The original sin is the birthplace of a majority of the drama that has happened on the series, at least with the doppelgangers and the Salvatore love triangles. The explanation of the doppelganger’s origin as nature’s way to create versions of the first immortals that could be killed finally made their existence completely sensible and even introduced a new obstacle for our beloved vampires to battle. Whatever ship you sail on, you probably groaned in this episode. Qetsiyah’s story of having to watch the doppelgangers fall in love with one another every five hundred years because destiny fated it so doesn’t provide much hope for Damon and Elena’s longevity. And since this episode ended with Stefan losing all of his memories of Elena (and Damon) it’s almost expected that (if he doesn’t get them back) he’ll be falling in love with Elena all over again. Qetsiyah’s line to Damon, “We’re merely the conflict that makes it interesting,” came off as a nod to the standard way of writing and pitted him as an intrusion on the doppelgangers’ stories. On the other hand, Damon and Elena decided to stand up against fate and create their own path. Elena has all ready cheated “destiny” before, surviving that time Klaus was going to sacrifice her to break his hybrid curse. The number of characters that Nina Dobrev and Paul Wesley play with distinction is becoming increasingly impressive, which is a bold statement considering how impressive they have already been. It’s a testament to the writing, the acting, the dressing, and the directing that it’s possible to tell these characters apart without having to ponder which version he/she is. One thing that especially stood out in the early scene between Katherine and Elena in “Original Sin” was that their voices sounded distinct: Elena speaks with her usual innocence, while Katherine’s voice sounded more weathered. Their time on screen together, or at least their presence in the same scene, continues to amaze. This week set up the potential for another Petrova doppelganger to be introduced – the one that existed between Amara and Tatia – which also means that Amara had a child at some point. There’s a reason the phrase “Hell hath no fury like a woman scorned” exists, and Qetsiyah proves the point. Yeah, she’s crazy and holding one resilient grudge, but she’s also sympathetic. Revenge is debatably the greatest and most relatable motivating factor in storytelling and overwhelmingly appropriate in this instance. Maybe it was just my own silly mind, but I expected Qetsiyah to be a little more wild and eccentric. That being said, the way she was presented was excellent. She was threatening and extensively powerful as a witch, while also believable and grounded in real human emotions. Janina Gavankar embodied this role exceptionally well, and luckily Qetsiyah’s plan is far from over.